We offer an extensive range of 3D Sign Board to our customers. We are offering Three Dimensional Curved Triangle Signages. Our curved triangle shape signage will be one of your most effective communication tool on the show floor, your brand will be easy to read. 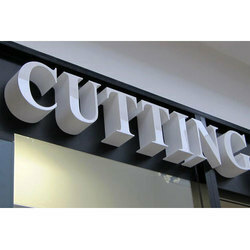 We are offering 3D Letters Signage Board. Matching up with the ever increasing requirements of the customers, our company is engaged in providing 3D Letters Sign Board.